Description: This application,"SnapShot", takes screenshots for upright cycle and other product images. SnapShot is no nonsense screen capturing tool that allows you to grab your desktop, window, or any part of the screen and save it as JPG or PNG. Description: This application,"PCLoupe", magnifies upright cycle and other product images. PCLoupe is a display tool that shows a magnified image of the area around your mouse pointer. Description: AF ScreenSaver is powerful and user friendly screensaver utility for Windows. With AF ScreenSaver you can play your favorites Flash movies as screensaver or you can create YOUR own Windows screensaver (and redistribute it) with powerful and easy-to-use screensaver creator. You don't need any developer studio or know any program language. It's really simple to use. Description: AJ Screensaver Maker help you make your own scrensavers.Just collect images,flashes and video file,without any professional skill,you can create your own professional screensaver.It also help you share it with your frields by create a single compressed self-installing screensaver setup file.More than 150 images transition effects in slideshow screensaver and can merge tow or more flash file to a screensaver. Description: AJ Screensaver Maker help you make your own scrensavers,just collect images,flashes and video file,without any professional skill,you can create your own professional screensaver.It also help you share it with your frields by create a single compressed self-installing screensaver setup file.More than 150 images transition effects in slideshow screensaver and can merge tow or more flash file to a screensaver. 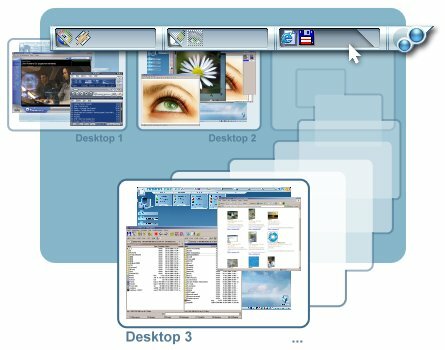 Description: AltDesk lets you easily arrange multiple tasks by means of Virtual Desktops used for the storage of individual groups of windows. You can switch Desktops and even swap tasks between them by using Drag and Drop. With AltDesk, you don't have to open and close numerous programs dozens of times a day: just place them on separate Virtual Desktops and turn to them only when they're really needed. You can create as many Virtual Desktops as you want. Description: AltDesk lets you easily arrange multiple tasks by means of Virtual Desktops used for the storage of individual groups of windows. You can switch Desktops and even swap tasks between them by using Drag and Drop. You can create as many Virtual Desktops as you want and work on various tasks simultaneously. The portable version of AltDesk can be stored on any removable data medium (CD, USB flash drive, etc.) and used on any computer. Description: This application,"apogee", is a windows boot screen changer for promotion of home exercise equipment. Sick of the stupid blue-sky, everything's perfect in Microsoftland Windows 95/98/ME boot screen yet? Description: AshSofDev Text Editor is a text editor that supports both rich text and plain text. It also has a multi document interface so you can have multible documents open in the same window, similar to microsoft word. Text to Speech and Speech Recognition are also supported.